Carlos was born in Colombia, South America into a very strong Catholic family. At the age of 21, he went to the States to study and through a Bible study that his uncle attended he came to know the Lord. Later he went to the Yucatán Peninsula in Mexico for 7 summers on short term mission trips with his home church. During this time at a missions conference in Atlanta, GA he felt that the speaker’s words described him: “Many are willing to go, but planning to stay.” The Lord put the desire in his heart to go to into full-time missions and he attended Columbia Bible College in South Carolina (currently CIU) to prepare. 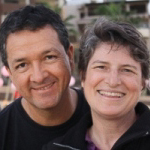 Carlos met his first wife, Genie Tindall, a TEAM MK from Venezuela, at CIU and they went to Mexico in 1990 with their first daughter, Ana. They were planting a church in Todos Santos, Baja California Sur, when Genie died very suddenly of spinal meningitis on Thanksgiving Day, 1994. Carlos returned to the home office with his two daughters to live with his in-laws and was later introduced to Sandy from the TEAM Japan field. They married and returned to Mexico in 1997. Together they helped with a church plant in Ciudad Constitución for a year and a half. Then in 1999 they started the Cabo Community Bible Church in Cabo San Lucas. In 2011 they turned the church over to a young Mexican who was saved in our church. After attending a Bible Institute he returned as youth pastor and then felt called to pastor the church. What a joy to see the church in the hands of nationals, healthy and vibrant, continuing to grow and to reach others with the Good News of salvation! Our desire is to start churches that become self-sustaining and multiply themselves. We love to share the gospel of Jesus with whoever the Lord puts in our path and see Mexicans saved and become part of God?s family and the local body of believers. We love to disciple new believers, to see them using their gifts in the body of Christ and sharing the Gospel with others. Carlos serves by evangelizing, preaching, teaching and training leaders. Sandy serves in women?s, children?s and music ministries. We love to counsel together and work as a team in growing the church. Currently Sandy is taking a 6-month language course in Guadalajara to improve her Spanish grammar. During this time we are taking exploratory trips in the mainland to see where the Lord would have us start the next new church. We are looking to start a new church in the Circle of Silence which includes 6 states in mainland Mexico where less than 2% of the population are believers in Jesus Christ. Catholicism is very strong so we want to shine the light of salvation in Jesus here. That the Lord will guide us to the place and the people with whom to work to start a new church and that there will be prepared hearts and much fruit. Would you like to join us as part of our church planting team?